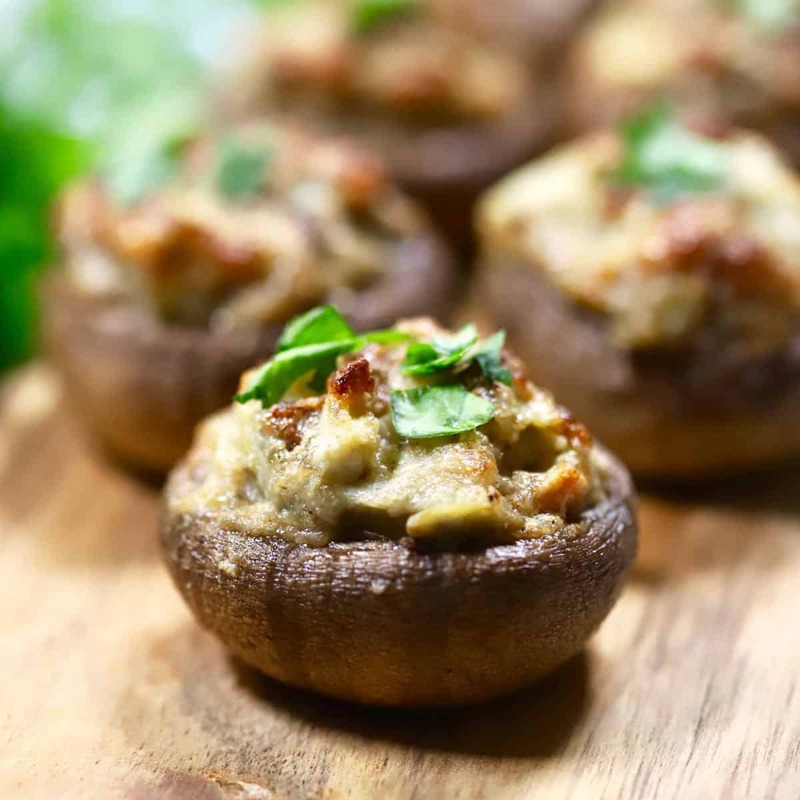 Whether you are looking for appetizers for a Christmas, New Year’s Eve party or for Super Bowl party food I have you covered with these delicious and Easy Artichoke Stuffed Mushrooms. Easy Artichoke Stuffed Mushrooms are the answer to your party or game day food quandary! If you are like me, you want something that is delicious, but it has to be quick and easy that can be prepared ahead of time and then just popped in the oven when your guests arrive or when the big game starts. Well then, let me introduce you to your new soon to be new favorite party food and game day appetizer Easy Artichoke Stuffed Mushrooms. If you like hot artichoke dip and if you like stuffed mushroom caps, you will love Easy Artichoke Stuffed Mushrooms. I took a dish of these tasty morsels to a party last week, and they were gone in a flash! 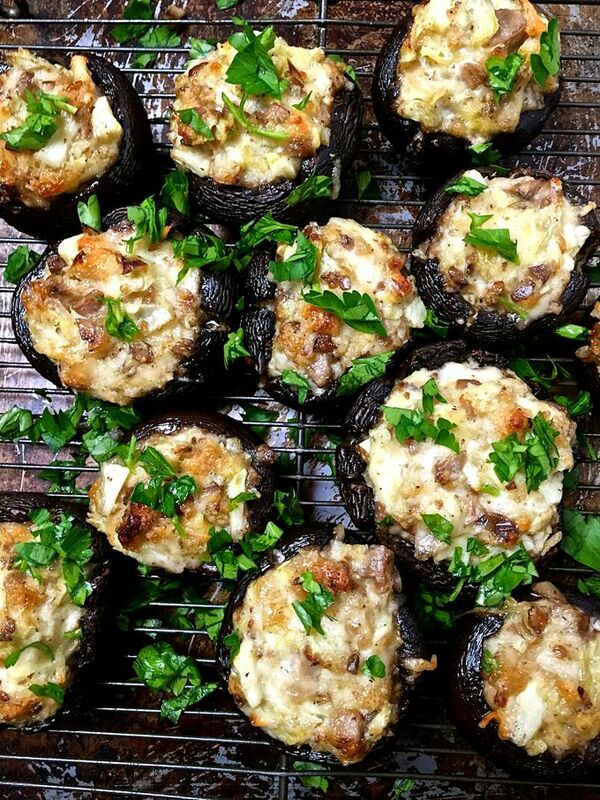 So depending on how many folks you are feeding, you might want to double this recipe for stuffed mushrooms! 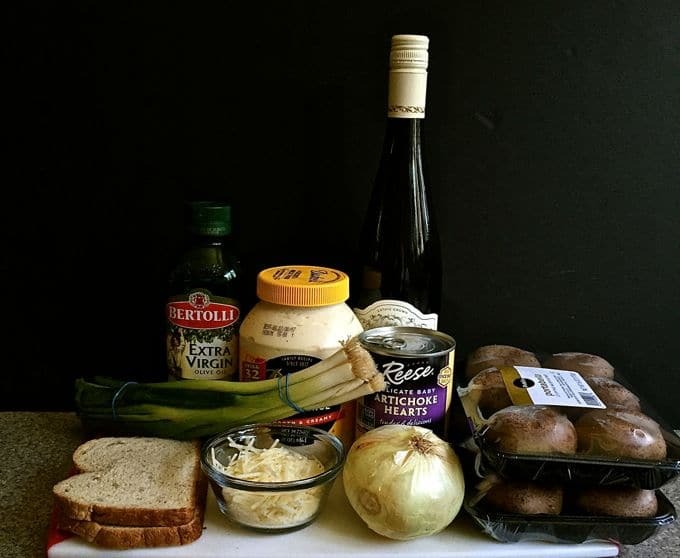 The ingredients for Easy Artichoke Stuffed Mushrooms include fresh button or portabella mushrooms, olive oil, chopped shallots, garlic, dry white wine, soft fresh breadcrumbs, a can of artichoke hearts, Parmesan cheese, mayonnaise, and kosher salt and pepper. To make Easy Artichoke Stuffed Mushrooms gather your ingredients and preheat the oven to 350 degrees F.
Lightly grease a wire rack and place it on a baking sheet with sides. 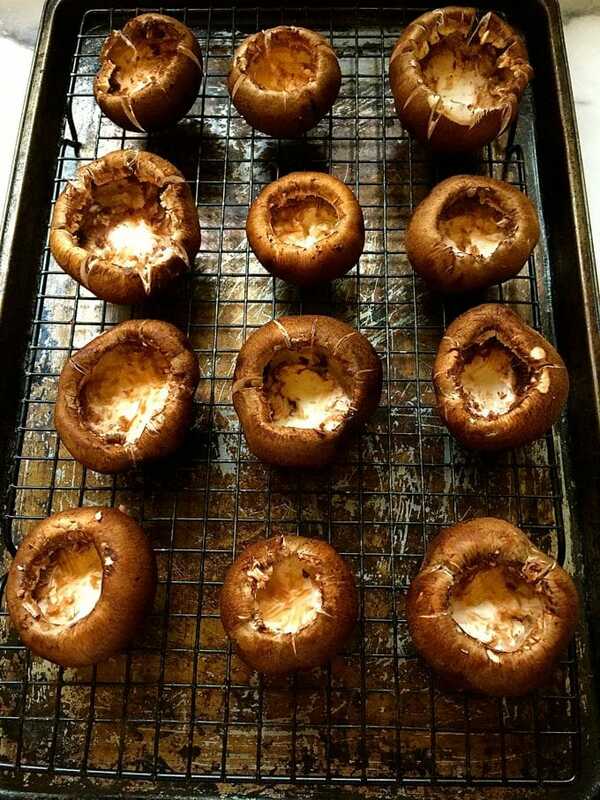 Wipe any dirt or debris off of the mushrooms with a damp paper towel. Remove the stems and chop them up. Place the mushroom caps on the wire rack. Heat one tablespoon of olive oil in a large skillet over medium-high heat. 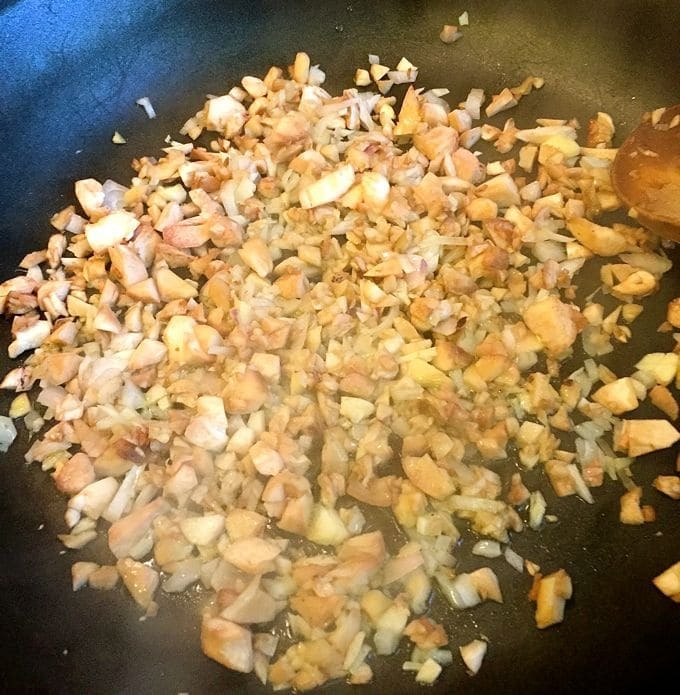 Add the chopped mushroom stems and minced shallots and cook 4 minutes. Add the garlic and cook an additional minute. Add the wine and cook for about 2-3 more minutes or until the liquid evaporates. Remove from the heat and let cool for a few minutes. 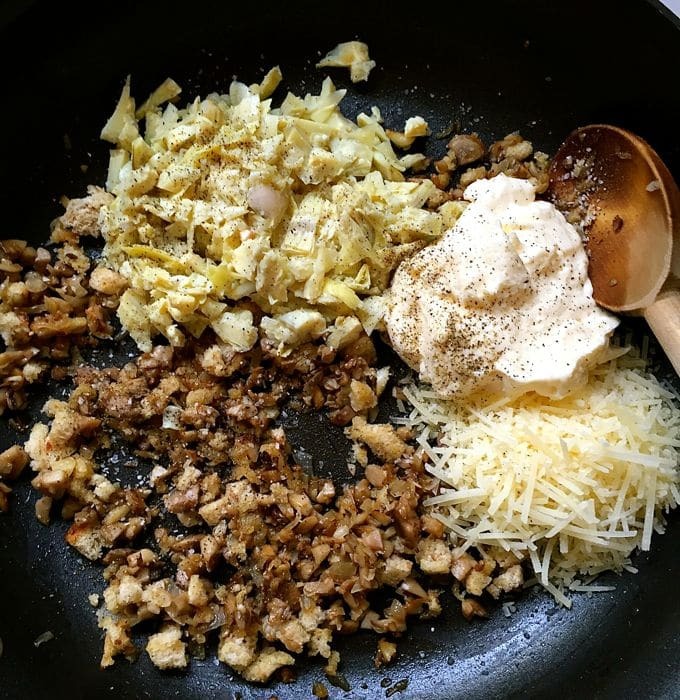 Add the breadcrumbs, chopped artichoke hearts, Parmesan cheese, mayonnaise, and salt and pepper to the mushroom mixture, and toss until well combined. Use a teaspoon and fill the mushroom caps with the artichoke mixture. Brush the mushrooms lightly with the rest of the olive oil. 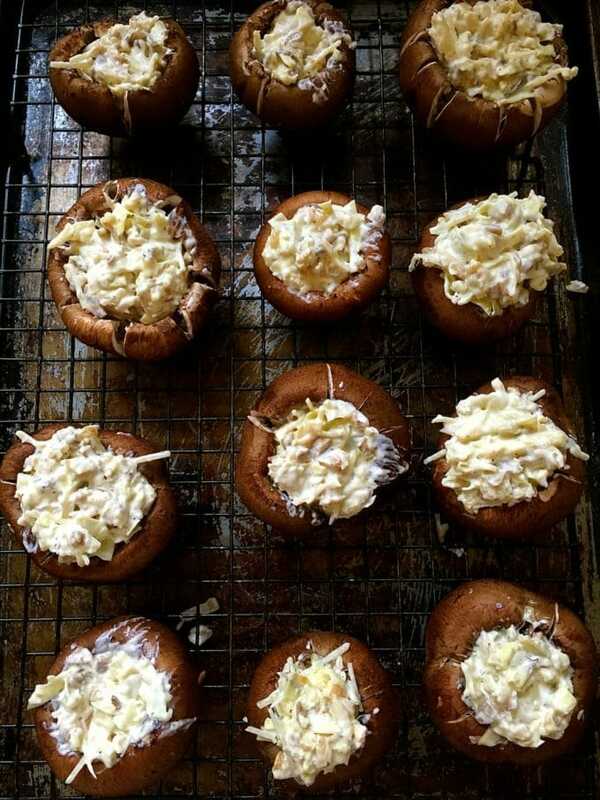 Bake for 15-20 minutes depending on the size of your mushrooms, or until the filling is golden brown. Serve warm. Whether you are looking for great Christmas or New Year's Eve party food ideas or Super Bowl snack recipes these Easy Artichoke Stuffed Mushrooms are perfect! *This recipe was updated on February 4, 2017, to include 1/4 cup dry white wine which was inadvertently left off the original list of ingredients. Sharon, These look absolutely divine! Artichokes and mushrooms are a culinary match made in heaven! Thanks so much Carol! They are yummy! These look wonderful! What kind of wine and how much? I don’t see it in the ingredients. Hi Sue, I’m so sorry about that! I used Chardonnay but I think Sauvignon Blanc or really any white wine would work. And you will need 1/4 of a cup. I am updating the recipe right now to reflect that. Thank you so much for letting me know and I hope the omission didn’t cause you any problems! Thanks so much for your quick reply! These are a hit in our Super Bowl spread! I’m so glad it worked out! And thanks again for catching that omission and letting me know! I have prepared the stuffing ahead and refrigerated it overnight. Then I stuffed the mushrooms and baked them the next day. I haven’t ever done it but would guess you could also go ahead and stuff them and bake them. And, then just reheat in the oven when you are ready to serve. Hope this helps and hope you enjoy them.